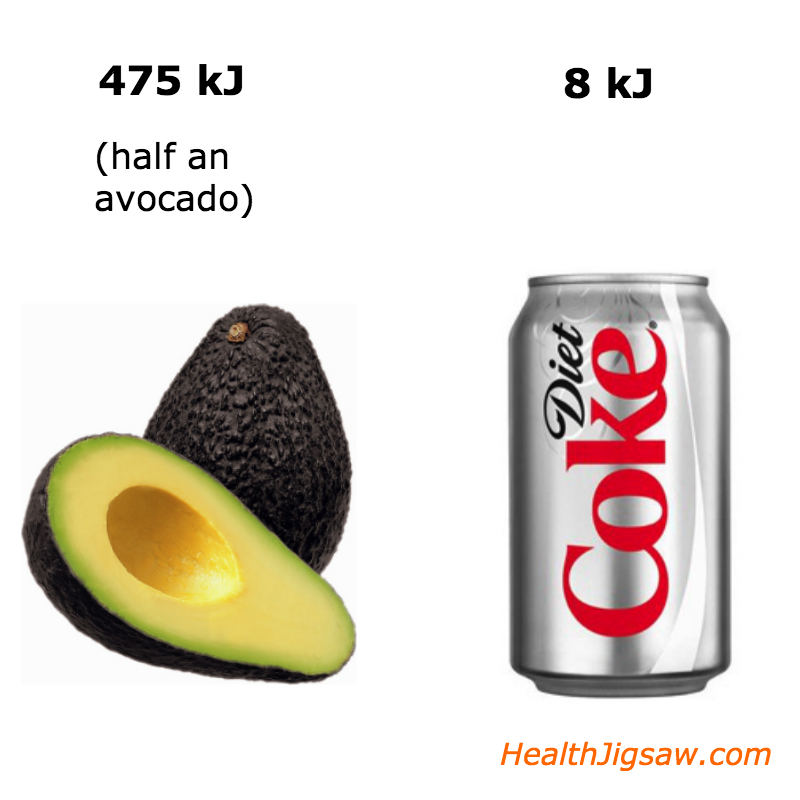 If you’re after fat loss, then eating or drinking something that has only 8 kilojoules (kJ) is better than 475kJ. Right? The above question would be technically correct if you’re into counting energy in versus energy out. However, if you look at quality versus quantity, then something that is low in kilojoules may not be the better option. Let’s take a look at a can of diet soft drink. To keep the number of kilojoules low, a chemical (artificial sweetener that is 200 times sweeter than table sugar) called aspartame is used. If you think that a drink that is low in kilojoules can help you shred some body fat, research has shown that this may not be the case – with diet soft drink users experiencing a 70% greater increases in waist circumference compared with non-users. Frequent users (who drank two or more diet soft drinks a day) experienced waist circumference increases that were 500% greater than those of non-users. And if you want proof that aspartame is bad for your overall health, then type “side effects of aspartame” or “cancer and aspartame” into Google and see what comes up. According to the Coca-Cola website, the ingredients of Diet Coke are: carbonated water, colour (caramel E150d), sweeteners (aspartame, acesulfame-K), natural flavourings including caffeine, phosphoric acid, citric acid. Feel free to Google the other ingredients. Meanwhile, the avocado has higher kilojoules because of its healthy fats (60% monounsaturated fat and 12% polyunsaturated). The healthy fats help release hormones in the intestine which may signal fullness and control appetite. Avocados are also rich in many nutrients (including fibre, vitamin C, vitamin E, vitamin K, folate, potassium) and low in sugar and sodium. The antioxidants in avocados can reduce inflammation at the molecular level, which reduces your risk of insulin resistance and obesity. To sum it up, if you’re aiming for fat loss, don’t just focus on the kilojoules number. Try eating as many foods in its natural state as possible (or foods with only one ingredient), and keep foods that come in a box, can, bottle or other forms of packaging to a minimum as they may be highly processed. Use the “grandparents” rule – if the food was around when your grandparents were growing up, then it’s probably ok to eat. There were not too many processed foods in the first half of the 20th century. Contact us if you need help with nutritional advice. Health Jigsaw is a mobile personal training business in Sydney’s Lower North Shore and parts of the Eastern Suburbs.